Still with lots more figures already sprayed Duck Season, I did a trial with a German line infantryman, covering him with washes of burnt umber acrylic paint. The paint I used was from the Daler-Rowney System 3 range. The System 3 burnt umber pigment is transparent to semi-transparent so lends itself well to washes. The result was surprisingly inspiring. I couldn’t even complain about the choice of Duck Season undercoat! Other colour primers could be tried later but for the present Duck Season had redeemed itself! The first figure to be painted in this way was a trial figure and my first attempt at a German line infantryman – the first of a possible 900! I was impressed enough to go on to paint the rest of the battalion with the same burnt umber wash technique. It seemed a canny way of tackling the prospective Austrian multitudes. However, I didn’t think it was a technique that would suit all the other figures or fit in with the rest of the army. So I would need to do a bit more experimenting. My first painted German line infantryman with its experimental paint job. 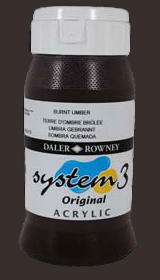 Daler-Rowney System 3, available in 75ml and 150ml tubes and in 250ml and 500ml pots.